Our BLACK TX3 Sahara Roof Rails really enhance your Volkswagen T5 Transporter SWB Van. Excellent value for your VW T5 Transporter & Caravelle SWB Van giving an excellent finishing touch. *If your vehicle is fitted with a T-Track system this must be removed in order to fit the roof rails. *Does NOT fit LWB or California models, if in doubt please feel free to call our sales team who will be happy to assist! I bought the rails with the cross bars too. I have no problem with the look of the rails (or bars), in fact they look great. I was not overly impressed with the way the rubber feet sit, all a bit fiddly to align. I did call Trade Vans service line and they were very helpful, great service. Overall impressed for the money. I bought these together with the cross bars in Black. The quality is great especially at the price paid - they are exactly the same as others being sold at a more expensive price. They were easy to fit and fitted perfectly onto my 2014 T5, the cross bars were also easy to assemble and very easy to fit. All the plugs to cover screw/bolt heads are a very tight fit and will not be lost! Brilliant. Good quality product, delivered on-time as promised. Outstanding quality for the price. 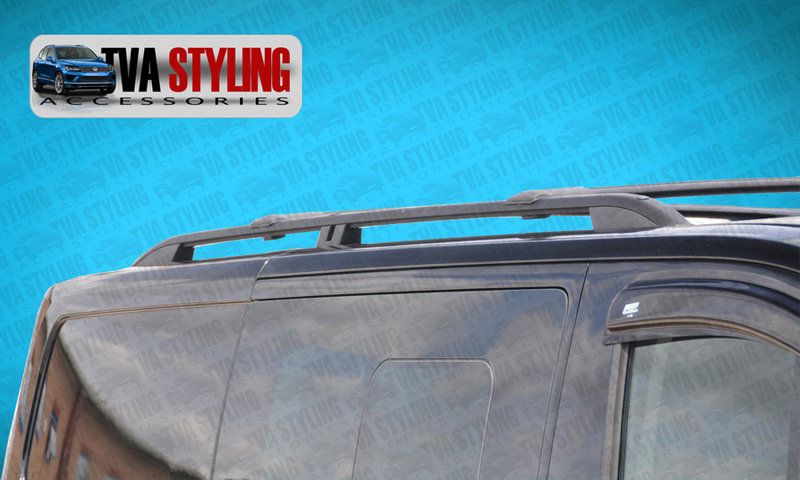 Click the button below to add the Volkswagen T5 Transporter Roof Rails Set TX3 Sahara SWB BLACK to your wish list.